Vision Quests of three days and two nights would be the ultimate, or even one day and one night. In these quests, someone would stay alone in the pyramid the whole time, an incredibly transformative experience. Perhaps one hour is enough for some, for those who simply want to experience it and that is enough. But an hour isn’t really very long for those who are used to meditating. Chanting the tones that are heard is the quickest way to raise the vibrational rate, and I mean just humming whatever pitch is heard and magnifying it. This will serve to open up the head centers, the perception centers. Now, most people will come in here with a desire, a question, because most are looking for answers. This is a place to get answers! This is a place to connect with Divine Sources, other dimensions, the angelic presences, the Ascended Hosts. So for those who are already fairly tuned and open, this will be a place to come to get some very clear answers and open up their perceptions of the inner realms, their psychic sight and hearing. The energy is so strong here that it simply opens up those capabilities. It is like coming to an oracle, and having a question and waiting for it to be answered in some way. You will find that when many people come in they suddenly have a clear channel they never had before, and access to knowledge and wisdom they never had before. They suddenly have a new sense of connectedness with the Earth and the cosmos both. Others will simply come in and gather the energies, and if they continue to do that repeatedly, or over a long period of time, they will create a monumental shift in their cellular structure, health and ability to incorporate more spiritual energy into their systems. It is fairly open what you can use this energy for, it is unlimited potential energy! It is unlimited because of the shape of the pyramid and the fact that this energy is focused. But also, it is unlimited because there are inter-dimensional connections. Through these you have access to tremendous wisdom and power for humans. There is also the connection here with the crystal in the mountain [Atlantian crystal that was reactivated on 9-9-9 in Mt. Shasta]. The pyramid is complete within itself, but it also has access to the energies of this crystal and therefore all the other Atlantian crystals that are being awakened. 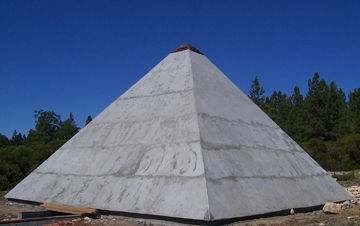 This access has enhanced the capabilities of this pyramid by allowing that crystalline energy in, and all of its attributes and connections. So in a sense, it has made this pyramid worldly, whereas without that connection it would have more of a local effect. I have to say I’m looking forward to the October event [10-10-10] as well as the June event [Initiations into the Order of Melchizedek] when people will be coming in here in groups again. I have been waiting for a long time, as you know, for this to be built, and I am very excited and I am here to stay. My assignment is this pyramid, and I will stay with it until it decays away. Permission given to share this message with others in its entirety and with proper credit.